"Anyone can write poems. Really. Here's the secret of poetry: the poems are already inside you. They are waiting." (Joyce Sidman, HMH Books, Poetry Kit). Poems, art, projects, imaginary play only need a spark -- a burst of imagination or inspiration -- to set forth spirals of creativity. 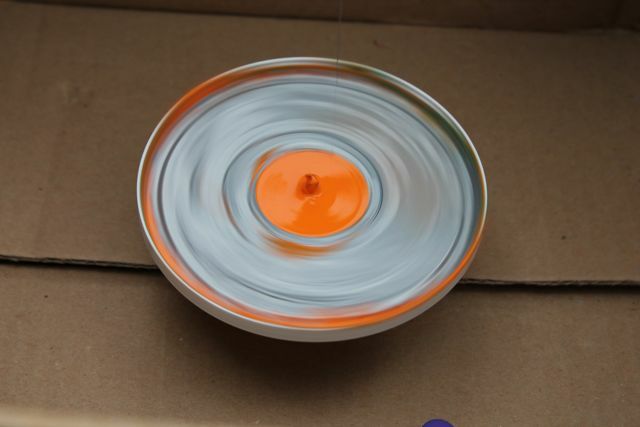 Some spirals of creativity swirl slowly, others at a much faster pace. Spirals of creativity can widen and grow into one complete product while others shoot off into many new and different directions. There will be spirals of creativity that will just fizzle out, but that is okay because it is the spirals that matter. 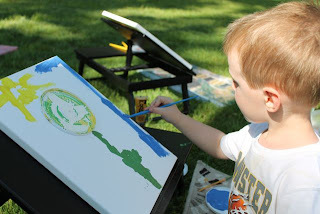 Where do your bursts of imagination or inspiration come from -- a conversation with a parent or a suggestion from a friend? 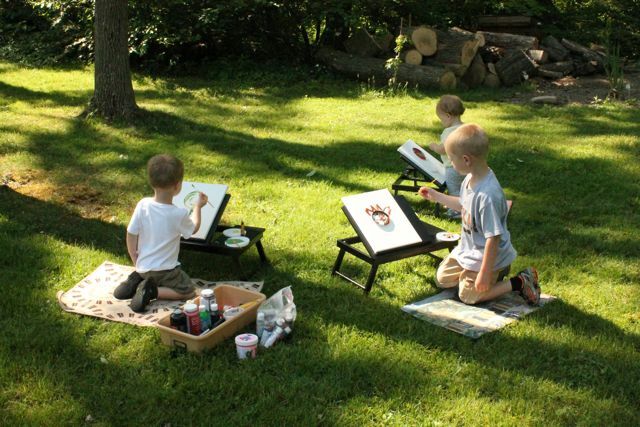 What will spark the next spiral of creativity -- a warm, sunny day or a really good book? 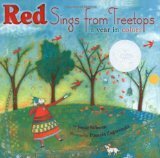 Joyce Sidman is the author of over ten books of poetry for children including many award winning books like Dark Emperor and Other Poems of the Night, a Newbery Honor Award winner and Song of the Water Boatman and Other Pond Poems and Red Sings from the Treetops: A Year in Colors, Caldecott Honor Award winners. Amazingly, Sidman who has been described as "one of the 21st century's best new poets for children," wasn't focused on writing poetry for children early in her career (Anita Silvey). "I first tried novels and picture books without a great deal of success, and then one of my writer's group members gave me an 'aha' moment, asking me why -- since I'd written adult poetry -- I hadn't tried children's poetry." (Miss Rumphius). This "aha moment" led to her first book of poetry for children, Just Us Two: Poems about Animal Dads (2000). As Joyce Sidman's career continues to spiral and grow, she continues to receive awards for her poetry, most recently the 2013 NCTE Award for Excellence in Poetry for Children. Many of Joyce Sidman's books of poetry are popular with school teachers and homeschooling families because of their emphasis on nature, including Butterfly Eyes and Other Secrets of the Meadow. Renee LaTulippe of No Water River asked Joyce Sidman about her attraction to writing poetry about nature. Joyce responded, "I love to ask questions: What makes a species survive? How do creatures make their way at night? Why do spirals appear so often in nature? I start with something that intrigues me." 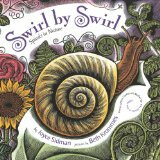 I became intrigued with celebrating Joyce Sidman's birthday when I received a promotional poster for her book, Swirl by Swirl: Spirals in Nature illustrated by Beth Krommes at a conference last summer. Upon reading the book to my children this week, we learned that spirals help animals retain warmth, offer protection from predators, and can even be a useful tool. 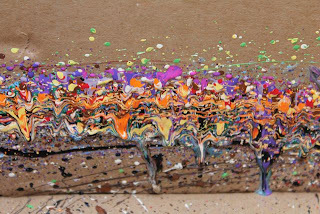 Joyce Sidman said, "It's always fascinated me that there are certain patterns that recur in nature. After many false starts with various pattern projects, the idea of a simple book -- just about spirals -- presented itself. They're so graceful, so beautiful, and they are found in so many places." (MYMCBooks). 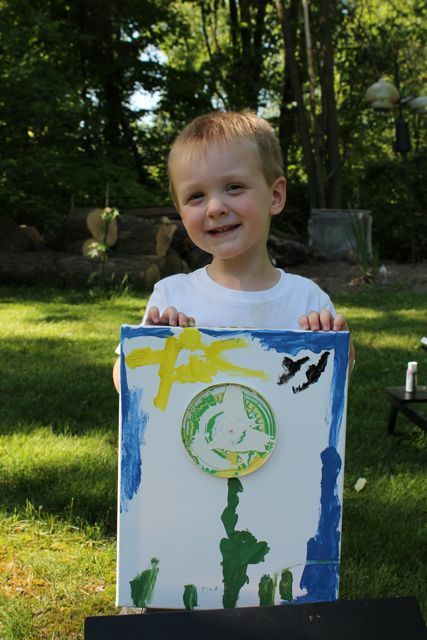 My family was inspired by Swirl by Swirl and a spiral of creativity started when I wondered if we could paint spirals...with a drill. (My first thought was to use a record player, but I didn't have one of those!) I warned my children before we started that I had no idea where this project was going to spiral, or if this idea was going to just going to fizzle out. We have painted on plastic container lids before and sometimes the paint has peeled off. My son sanded each lid in hopes that the paint would stick better. 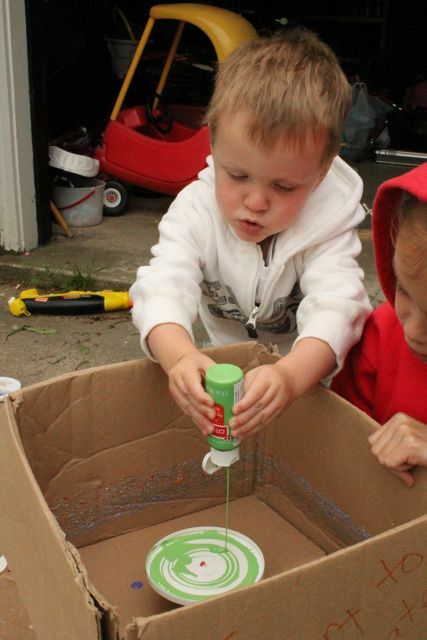 Next we stuck our drill through a cardboard box and pushed the plastic lid onto the drill bit. My children took turns pushing the button of the drill to make the lid spin while someone else squirted paint from above. 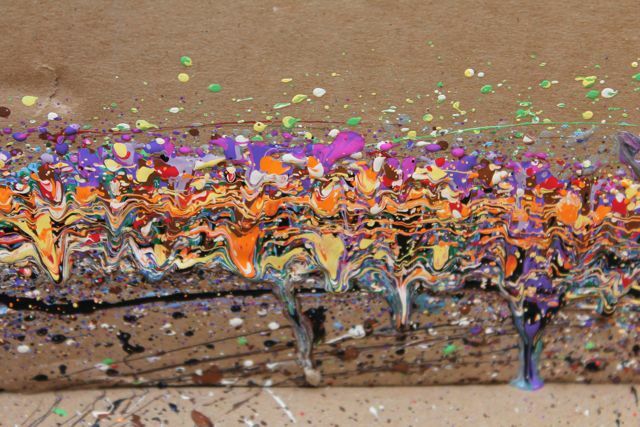 The spinning action of the drill swirled the paint around on the lid. 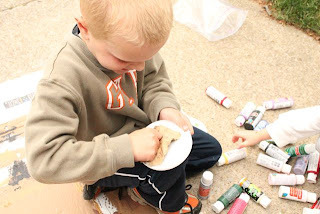 My children enjoyed layering colors to create their design. Sometimes they squirted a lot of paint and other times very little. I carefully removed the lid from the drill when they were happy with how it looked. 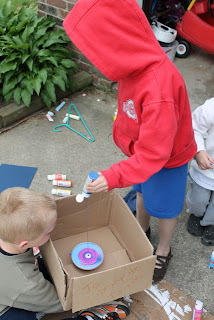 They created many cool designs. The cardboard box ended up being a work of art too! 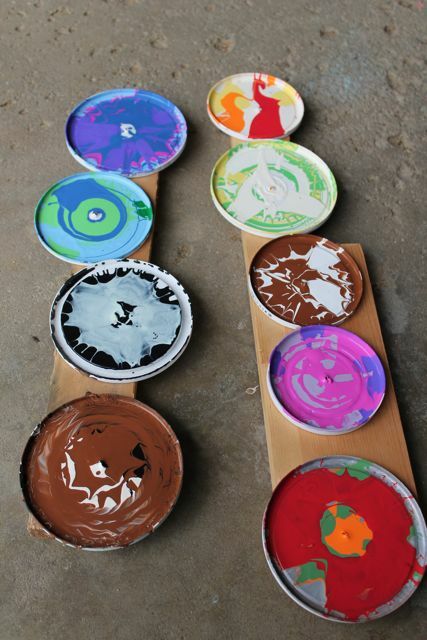 Our swirl lids were fun to make, but as days passed this project idea wanted to spiral further. 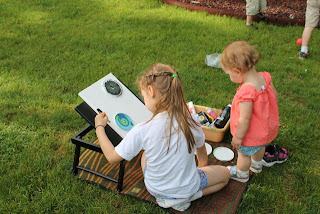 Joyce Sidman's book, Swirl by Swirl was all about spirals in nature and I thought our project needed more of an emphasis on nature. So, a few days later, I set up three canvases in the yard on a warm sunny morning. 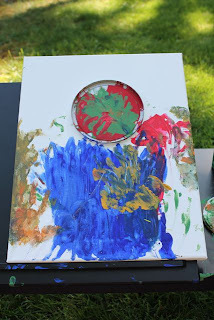 I asked my children to pick their favorite swirl lid and we glued it to a canvas. 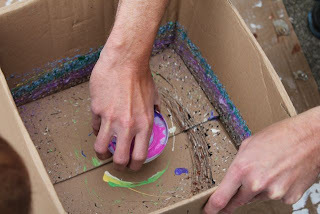 Then, we talked about what we could do to turn our swirl lid into something from nature. My youngest son decided to turn his lid into a flower. 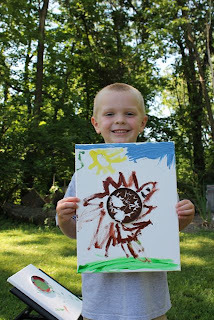 My oldest son turned his into a porcupine. 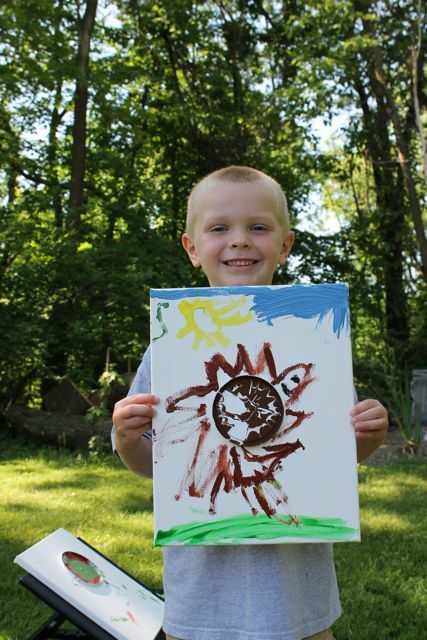 Since we were outside, my son observed the sun, the sky, grass, and the bugs around him and incorporated his observations into his painting. My 1 year old daughter loved this activity too. I think she tried every color of paint. 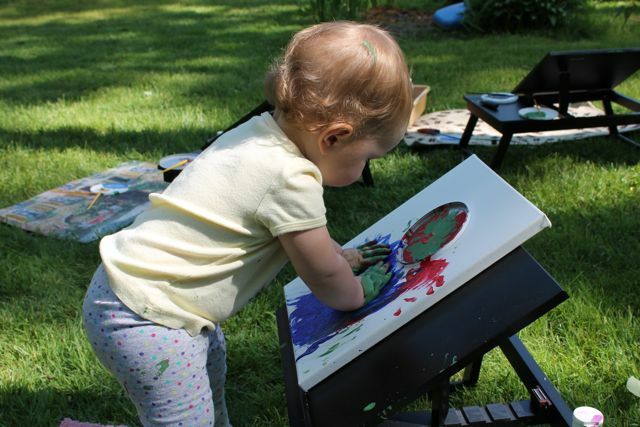 This is her first canvas-painted masterpiece. 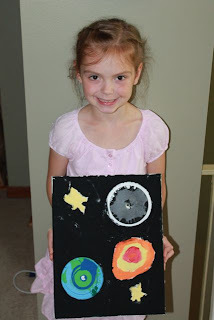 My oldest daughter was intrigued by the project and wanted to be included too (she missed the activity because she was at school). So, the following morning we set her up with everything she needed. She chose to include two swirl art lids -- one that was blue and green that she thought looked like Earth and another that had glow-in-dark paint that she thought looked like the moon. 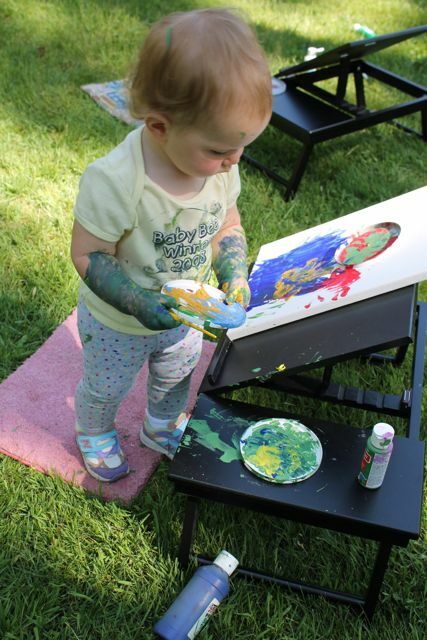 Her younger sister was eager to show her the best way to paint! 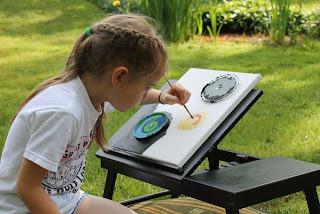 In this photo she is adding a spiral-like sun shape to her painting. Swirl by Swirl sparked a small idea about painting with a drill that spiraled, widened, swirled, and grew into beautiful works of art. 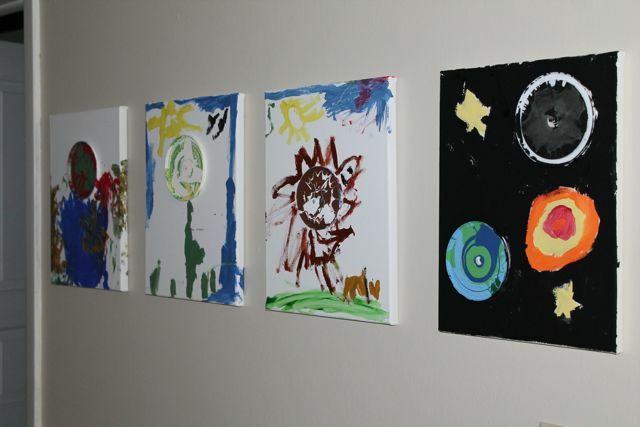 We were so happy with our paintings that we hung them in the hallway! As I finished editing this post, my oldest daughter was reading This is Just to Say: Poems of Apology and Forgiveness in her room before bed! Yay! Click here to see and hear Joyce Sidman read a poem from the book!